I brought the charger home, charged up two of the included silver batteries, then used them in my Magic Mouse, all was well. Then curiosity took hold and I tried to insert another brand of rechargeable NiMH battery in this charger. Guess what? The Apple charger flashed a Yellow distress light, because it will only charge the six included batteries and not any other brand of rechargeable battery. How could a major American company create a battery charger and disable it from charging any NiMH battery? The greedy marketing folks at Apple clearly went overboard and paranoid in this case by insisting that only Apple batteries can be recharged and not other NiMH batteries. Apple may be so embarrassed by this offense that they have recently removed this product from their online store. The only place that I found one for sale was at Amazon.com, but none are listed at www.apple.com. I’m all for building the economy, but, making accessories that only work for a single brand? Like U said, not very brilliant on the rotten Apple brand. Your link to the Amazon store has many comments with people using other NiMH batteries brands successfully. (Panasonic, Duracell). Let me guess, you bought your other batteries at Fry’s? Dave, I bought my other rechargeable AA batteries at Fred Meyer, but cannot remember the brand, just the fact that my Apple charger wouldn’t work with those batteries at all. 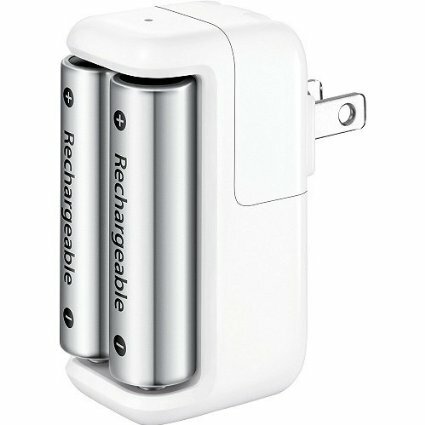 As of May 25, 2017 the online store at http://www.apple.com still does not sell this battery charger.